Authorize.Net is a large U.S.-based payment gateway that allows you to accept online credit card and electronic check payments. The claimed user base of more than 230,000 merchants makes it one of the largest internet payment service providers. X-Cart is currently integrated with two payment methods offered by Authorize.Net: Server Integration Method (SIM) and Advanced Integration Method (AIM). The major difference between the two methods is where you host the payment pages for you store. A third Authorize.Net's payment option supported by X-Cart is Authorize.Net: AIM. eCheck, which is an implementation of Authorize.Net: AIM for electronic check payments. 7.1 Authorize.Net error: "(14) The referrer, relay response or receipt link URL is invalid." 7.2 Authorize.Net error: "MD5 transaction signature is incorrect! (Reason Code 0 / Sub 0)"
7.3 If Autorize.Net is successfully contacted but you get an error message. With Authorize.Net: SIM the payment pages are hosted on the side of Authorize.Net, which means that Authorize.Net provides all the necessary resources to process a transaction, including collection of payment information. Customers get redirected to the Authorize.Net secure website and enter their card details there. Authorize.Net: SIM is a right solution if you do not have adequate resources to collect and transfer sensitive card details. For example, SIM does not require you to obtain and install an SSL certificate on your server/hosting account. 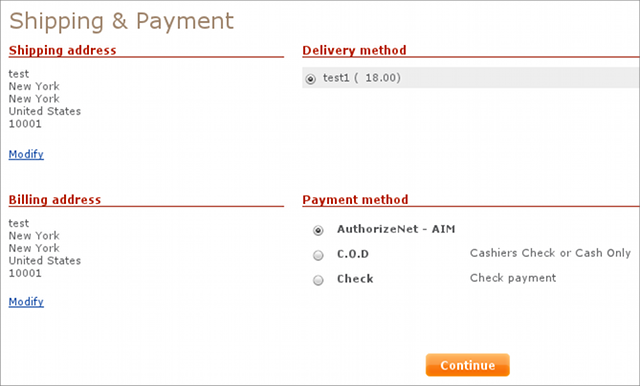 With Authorize.Net: AIM the payment pages are hosted together with the rest of the store. The data is transmitted to Authorize.Net in the background mode and customers never leave your website during the purchase. Since Authorize.Net: AIM involves collection and transmission of sensitive cardholder data, you must ensure the security of this data by setting up secure connection with Authorize.Net. Otherwise, Authorize.Net will reject the transaction. Secure connection is implemented through an SSL certificate installed on your server/hosting account. For recommended SSL certificate providers please check the X-Cart marketplace at http://marketplace.x-cart.com/ . Another requirement of Authorize.Net: AIM is that your server must provide support for at least one of the following HTTPS modules: Net::SSLeay, CURL, libCURL, OpenSSL or HTTPS-cli. Authorize.Net: AIM. eCheck uses the same logic as Authorize.Net: AIM, but it is meant to process electronic check payments - not credit card payments. Like Authorize.Net: AIM, the eCheck implementation also requires an SSL certificate and one of the supported HTTPS modules. If you have not yet registered an account with Authorize.Net, you should do it before you start setting up Authorize.Net in X-Cart. To open an account, go to the Authorize.Net website at http://www.authorize.net/signupnow/ and follow the instructions on the screen. After you have registered an account, you can set up Authorize.Net: SIM, Authorize.Net: AIM and Authorize.Net: AIM. eCheck in the X-Cart Admin area. 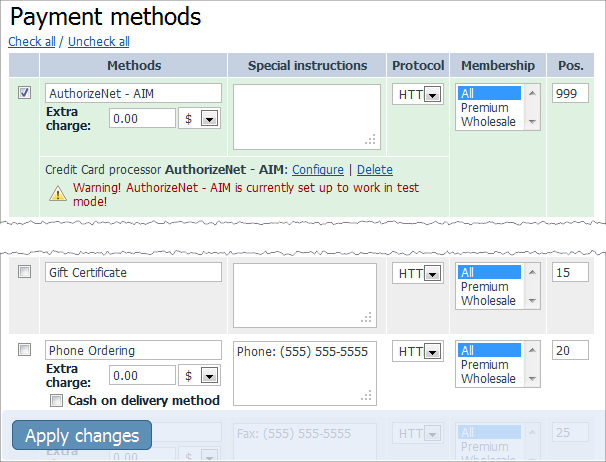 In X-Cart 4.5.0 the Authorize.Net AIM integration was removed from the X-Cart core for the sake of PCI DSS compliance. However, it is available for this and older versions through our PA DSS certified payment application X-Payments. 2. Go to the Payment methods section (Administration menu -> Payment methods) and scroll down to the Payment gatewaysform. 3. Select Authorize.Net: AIM from the drop-down list and click the Add button. Clicking the Add button adds Authorize: AIM to the list of the available payment methods. 4. Click on the 'Configure' link. This opens the configuration page for Authorize.Net:AIM. Account type: Select from Card not present or Card present. API Login ID: Enter the name of your merchant account with Authorize.Net. Transaction key: Enter your Authorize.Net transaction key. In the Security section, click API Login ID and Transaction Key. Enter the answer to the Secret Question configured during the account setup. MD5 hash value: Enter the MD5 hash value, which is set up in your merchant account. When you choose to use the "live" mode, be sure to enable the "live" mode in your Authorize.Net account as well. * Test Results: Depending on the dollars value passed through the gateway the result will either return as transaction successful or failed. Example: to test the AVS response reason code number 27, submit the test transaction with the credit card number 4222222222222 and the amount $27.00. Order prefix: Enter a prefix that will be automatically added to IDs of orders placed in your store and paid through Authorize.Net: AIM. Action to be performed on order placement. Choose whether Authorize.Net must capture the money automatically (Auth and Capture) or only freeze the funds until you capture the authorized amount manually through the X-Cart Admin area (Auth only). 6. Click the Update button to apply the changes. After you have configured and activated the gateway, your customers will be able to choose Authorize.Net: AIM as a payment option. 3. Select Authorize.Net: SIM from the drop-down list and click the Add button. After you have clicked on Add, Authorize: SIM will be added to the list of the available payment methods. 4. Click on the Configure link. This opens the configuration page for Authorize.Net: SIM. 5. Adjust the configuration settings for Authorize.Net: SIM and click the Update button to apply the changes. Valid Referrer URL: The URL from which Authorize.Net: SIM will receive data from X-Cart. Important: Authorize.Net uses the URL to check whether the payment request is sent by your store, not a fake website. Make sure the URL in the X-Cart Admin area coincides with the respective URL in the Authorize.Net back-office. Relay URL: The URL to which Authorize.Net must land customers back to X-Cart after a payment has been processed. In the Security section, click Obtain Transaction Key. Enter the answer to the Secret Question configured at account setup. The difference between your server time and the Authorize.Net server time (in seconds): Enter the number of seconds between your server time and Authorize.Net server time. Each time X-Cart performs a SIM transaction, Authorize.Net generates a new fingerprint to authenticate the transaction. Among other parameters, the fingerprint also includes a timestamp of when the fingerprint was generated. The timestamp must coincide with the time of the Authorize.Net server, which uses Greenwich Mean Time (GMT). Sure, your server is likely use a local time zone that is different to GMT. To ensure successful authentication, you must iron out the difference in server time by adjusting the value of this field. The value must be setup in seconds. Although it is not required that the difference is covered to the last second, it must be no more than 15 minutes ahead, or 15 minutes behind the Authorize.Net server time (GMT). Otherwise, authentication will fail. For example, if your server uses a local time zone GMT +2, the value must be 7200, which is equal to the number of seconds in 2 hours; if your server uses a local time zone GMT -6, the value must be -21600, which is equal to the number of seconds in 6 hours, and the minus sign indicates that the time must be subtracted from GMT. Also, be sure to account for daylight savings time. Currency: Choose the currency in which you wish to accept payments through Authorize.Net: SIM. Note: When you choose to use the "live" mode, be sure to enable the "live" mode in your Authorize.Net account as well. Order prefix: Enter a prefix that will be automatically added to IDs of orders placed in your store and paid through Authorize.Net: SIM. Having a prefix ensures that orders will have unique IDs and will never coincide with orders placed in another online store of yours that also uses Authorize.Net as a payment option. 6. Return to the list of payment methods and activate Authorize.Net: SIM by selecting the check box next to the gateway's name. 7. Click the Update button. 8. Adjust the configuration setting in the Authorize.Net back-office. Log in to your Authorize.Net account at https://account.authorize.net/ . Go to the section Settings -> Response/Receipt URLs. Click the Add URL button and enter the URL from the Valid Referrer URL field of the Authorize.Net configuration page. Default Field Separator = , (comma). After you have configured and activated the gateway, your customers will be able to choose Authorize.Net: SIM as a payment option. Go to 'CC/ACH processing' menu, select 'Authorize.net' as an active CC processor, click 'Continue' and complete the settings form. Enter merchant login and transaction key. Choose the currency and enter order prefix. Authorize.Net error: "(14) The referrer, relay response or receipt link URL is invalid." IMPORTANT: If you have PROTOCOL column set to HTTPS for 'Authorize.Net: SIM' payment method, the URLs must have "https" and vise versa. Authorize.Net error: "MD5 transaction signature is incorrect! (Reason Code 0 / Sub 0)"
If Autorize.Net is successfully contacted but you get an error message. It can be found on the error message page (in earlier versions, in the browser address string), so you will know what is wrong. In this case you should do the following: login to your merchant account, go to 'Settings' -> 'Payment Form' -> Form fields and uncheck 'Required checkbox' next to this field. Another possible cause of orders declining is that AVS checking is too strict. Go to 'Settings' -> 'Address Verification System Settings' and uncheck all Reject flags. This means that Authorize.Net hasn't been contacted. First, check if payment/authorize_net.pl has executable permissions. If it doesn't, run the shell/ftp command - chmod 0755 authorize_net.pl. The second possible cause: Net::SSLeay Perl module is not installed. Refer to the corresponding FAQ item that explains Net::SSLeay Perl module installation. Rarely happens: your Perl script may have been corrupted during its uploading to your server from Windows machine. If you edit Perl script in Windows editor (like NotePad), you should upload it in ASCII mode to convert Windows new line symbols to UNIX new line symbols. informing them of the error. The following is the result of the attempt to charge your credit card. these timeouts include Internet traffic, your server is overloaded or malfunctioning, or Internet routing issues. receive the message you are seeing. As a possible solution, try to increase the time-to-live (TTL) setting for the response URL domain (i.e. up to 1 week). Please contact your hosting provider to implement the necessary changes. This page was last edited on 8 October 2015, at 13:31.